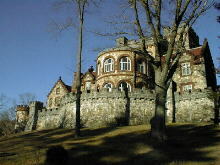 Searles Castle in Windham was ordered built by Edward Francis Searles. He hired architect Henry Vaughn to design it to be a 1/4 size replica of the medieval Tudor manor of Stanton Harcourt in Oxon England. It is built of cut granite, fieldstone, and dark red sandstone most of which came from Searles' own quarries in Pelham, NH. It's construction began in 1905 and was completed in 1915 at a cost of about one and a quarter million dollars ($1,250,000). The castle consists of an Entrance, a Reception Hall, a Foyer, a Dining Room, a Music Room, a Sun Porch, a Library, a Grand Stairway, a Second Floor Guest Suite, a Third Floor Guest Suite, a Second Floor Rotunda (or Balcony), Servants Rooms, a Kitchen, a Butlers Pantry, Butlers Rooms, and a Master Bedroom Suite which consists of; a Master Bedroom, a Sitting Room, a Bathroom, and a Sunroom and today, there is also a Castle Gift Shop. Edward Searles was born in Methuen, MA on July 4, 1841. Over the years, he was a piano teacher, carpenters apprentice, upholsterer, and an interior decorator. When he married, he wed a woman by the name of Mary Hopkins who was 22 years older than Edward. They married on Nov 9, 1887 and took a six month voyage to Europe. In 1890 the couple lived in Rome for a short time, but their happiness was short lived, the following year, Mary died on July 25 at the age of 72. After the death of his wife, Searles ordered some items to be moved to the castle in Windham from his house in Barrington. These included the Gothic Doors of Windsor Castle, the Napoleon Fireplace from the Palace of the Tuileries and the Grand Staircase. Mr. Searles was a generous man who donated many things to the town of Methuen where he was born, including many buildings, bridges, churches, schools, a railroad and an organ factory. When Searles died on August 6, 1920, he left the castle to his executive secretary Arthur T. Walker. When Mr. walker died seven years later, he left the castle to his niece Iva C. McEachern who sold it to real estate broker Frank M. Andrews in 1930 for two million dollars. Mr. and Mrs. Andrews lived in the castle from 1943 to 1952 at which time it was sold to the Sisters of Mercy. For a while, they used it as a novitiate for young women who were entering the Sisters of Mercy. From 1962 to the mid 1980's, classes were held in the castle. Due to water damage and other problems, the castle was closed for about five years. The roof was replaced and in 1990, the decision was made to reopen the castle. Through the generosity of interior designers and many contributors, the interior of the building has been refurbished and opened to the public for educational, cultural, spiritual, and social activities. Click here for more information about Searles Castle. 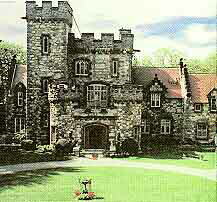 Searle's castle in Windham, NH will be open to the public for one day to celebrate the 100th anniversary. It will be $5.00 admission and it's on Sept. 11th this year, which I believe is a Sunday. It's impossible to get into that castle unless you are getting married, it's not open to the public. If you haven't been there, the grounds are stunning!! They also have opportunities for weddings and other corporate events, but it is open to the public for three weekends usually near the end of October - early November for their annual Christmas event. Numerous local florists decorate each room and you have the opportunity to purchase any decorations that suit your fancy. There is an admission fee which goes to the Sisters of Mercy charitable fund. Just wanted people to know because it is a beautiful place in a beautiful setting especially in the fall in NH. Photo #1 courtesy of Phil Bilzor. Photo #2 courtesy of Alfred Fairbrother. A special thanks to Mary Lee Underhill for sending us a copy of the book she compiled called "Edward Francis Searles and His Castle in WIndham" from which this information was taken.